A white flag, with the town seal in the center. The seal shows the public library, surrounded by a ring of small flowers, and a light blue outer ring with the town name is written on it, and and a thick black outermost ring. 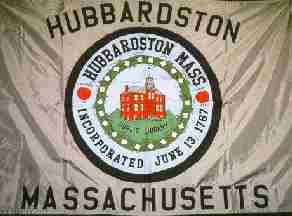 Hubbardston is in Worcester County.